Translation from German to English by Father Jonathan Fischer, O.S.B. 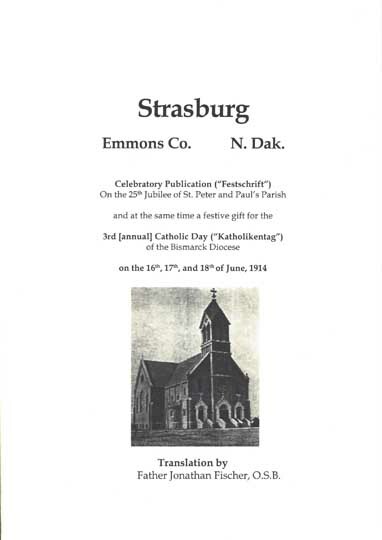 The Germans from Russia Heritage Collection is pleased to provide this valuable publication for Strasburg, Emmons County, in south central North Dakota. Strasburg was primarily settled by Catholic Germans from Russia who came from the Black Sea German villages of Baden, Elsass, Kandel, Mannheim, Selz and Strassburg, South Russia, today these villages are close to Odessa, Ukraine. 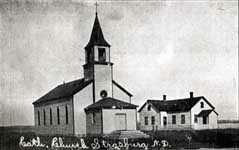 First ever Catholic Church in Strasburg, N.D., an all wooden church and rectory. At the beginning of the book, Father Jonathan Fischer wrties: "What follows is a translaton from the German of a remarkable little book published to help celebrate Strasburg, North Dakota on the occasion of the 25th Jubilee of St. Peter and Paul's Catholic parish in that city. The booklet is also being use to hone the fact that the 3rd annual "Catholic Day" of the Diocese of Bismarck, ND was being held in Strasburg in the summer of 1914. The orginal book was printed in Gothic German type face." The Foreword shares: "This year is the jubilee year  for the Strasburg community since this community was founded. For this reason this blossoming community looks back with interest, joy, and gratitude on the 25 years which were so rich in suffering and joy, in privations and successes. 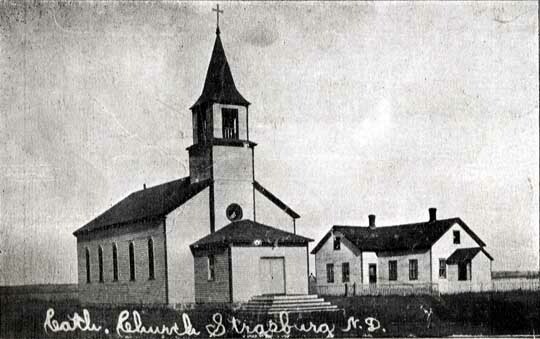 Today, after 25 years, the first settlers look back with satisfaction and pride on all the difficulties more richly repaid for all they went through when they see how the community of Strasburg, seen from any point of view, has developed into a blooming parish, which can rightly be numbered among the better parishes in the Diocese of Bismarck, perhaps even in the whole state of North Dakota. The following pages are intended to give a glimpse of these 25 years which now belong to the past. And in particular they are to show our young people what must be done to make something of oneself, but also what one must do to build up a community and to establish and maintain in it a peaceful and orderly relationship." The publication includes a section of "The First Settlers" of the fall of 1888 with valuable historical and biographical information: Jakob Feist, John Baumgartner, Frank Baumgartner, Caspar Feist, Joseph Burgad, Albin Schneider, Frank Giesinger, Egidi Keller, Peter Kraft, Jakob Geffreh, Lorenz Schwab and Martin Schwab.Other sections include: "The First Priests," "The First Church," "the Building of the Priests's House," "Building of the New Church," "The Religious Life of the Parish," "Church Singing," "The Strasburg Cornet Band," "The Catholic Parish School," "The Ursuline Convent," "The Cemetery," and "The City of Strasburg." 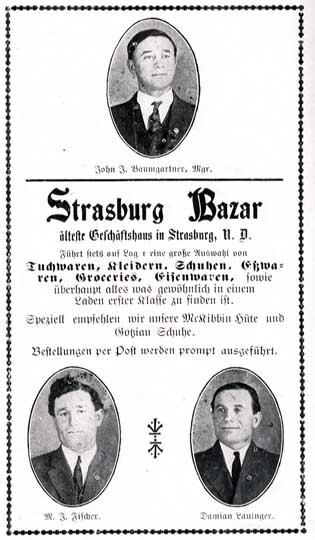 There are numerous historical photographs and interesting advertisings with text translated to English including the Strasburg Bazaar, Convent of the Ursuline Sisters, The Farmers Store, The Golden Rule Store, Security State Bank, Strasburg Drugstore, Baumgartner, Brickner Bros. Co., M.A. Klein & L. I. Mastel Dealer, Strasburg Lumber Co. Photographs include historic photographs of Strasburg, the Catholic priests who served Strasburg to 1914 (Rev. Benedict Peter, O.S.B., Rev Justus Schweizer, O.S.B., and Rev. Alois Strigl, O.S.B.) M.A. Klein, Trustee, Mike Baumgartner, Trustee, John J. Baumgartner, President of the Bismarck Diocesan League, Conrad Kraft, Secretary of the Bismarck Diocesan League, Strasburg Church Choir, and the Strasburg Music Band.